US ultra low-cost carrier (ULCC) Spirit Airlines is adding Kansas City to its network roster starting in Aug-2014 as it presses forward in introducing its service model into markets it deems as ripe for stimulative fares. Southwest is the largest carrier at Kansas City measured by seat deployment, but in its route rollout Spirit is largely taking aim at US major carriers American, United and Delta. Spirit’s introductory route pattern in Kansas City reflects its strategy of “connecting the dots” to some of its more dominant US domestic markets as many new routes deployed from the airport are into some of its top bases. Spirit’s approach in Kansas City could hold clues to its future expansion strategy. The carrier is connecting a smaller market with larger metropolitan areas dominated by US network carriers that, until Aug-2014, will hold either monopolies or duopolies on the routes. With 30% growth planned in 2015, more types of those routes are likely in the offing for Spirit. To a certain extent, Kansas City has felt the effects of US airline consolidation that has occurred during the past decade. Kansas City was a hub for Midwest Airlines, purchased by Republic Airways Holdings in 2009 and later folded into Frontier Airlines – which was also bought by Republic in 2009 and sold to Indigo Partners in late 2013. 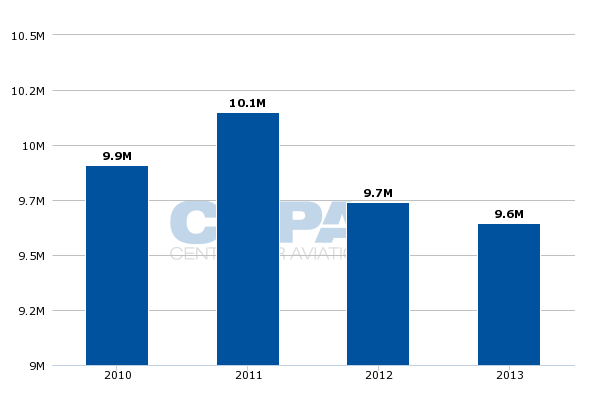 Frontier’s downsizing of Kansas City occurred in 2012, and from CY2011 to CY2012 the airport’s passenger stats fell 4% year-on-year. During CY2013 Kansas City’s passenger numbers fell further, by roughly 1% from the year prior. 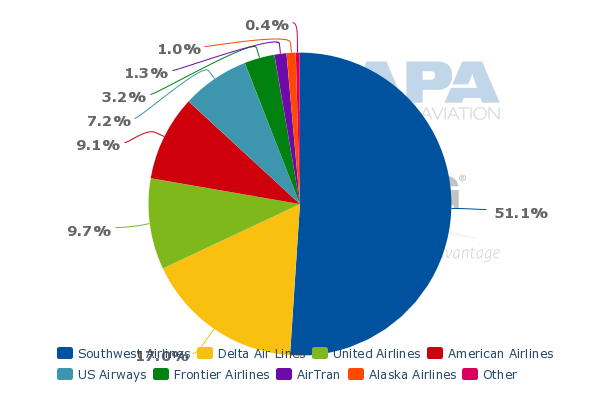 Southwest has also maintained a strong presence at Kansas City and presently holds an approximately 51% seat share at the airport. The latest data from the US Bureau of Transportation Statistics show that average fares at Kansas City (inflation adjusted) during 4Q2013 were USD363, up from USD357 the year prior. Average US domestic fares (again, inflation adjusted) during 4Q2013 were USD381. The data show that Las Vegas recorded the lowest average fare in 4Q2013 of USD255 and Huntsville, Alabama had the highest fare, reaching USD528. Kansas City seems like a nice fit for Spirit, whose model is to use low fares to stimulate traffic rather than stealing existing passengers from other airlines. During the last few years Spirit has rapidly expanded into the US domestic space through a build-up in Dallas/Fort Worth, Houston, Chicago and Las Vegas. 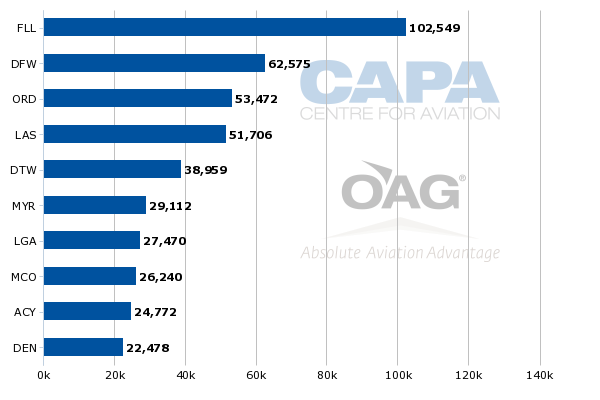 But even as Spirit recorded 22% capacity growth in CY2013, it only represented roughly 1.4% of the weekly seats in the US market place for 12M ending Jul-2013, which shows the carrier has considerable room for expansion. Spirit is not exactly taking direct aim at Southwest when it launches new service from Kansas City in Aug-2014. The ULCC’s new routes are to some of its largest markets – Chicago O’Hare, Dallas/Forth Worth, Detroit, Las Vegas and Houston Intercontinental. By the time Spirit fully spools up all those markets in early Sep-2014, it will offer approximately 1,015 seats per week on four of the new routes from Kansas City, a small fraction compared to seat deployment from the dominant carriers in those markets. Those pairings would appear ripe for Spirit’s lower base fares, which averaged roughly USD79 in CY2013. Spirit charges for everything outside the base fare (bags – overhead and checked – drinks and food and printed boarding passes at the airport). Factoring in its average non-ticket revenue in CY2013, its total all-in fare of USD133 was still relatively low, and solidly lower than Kansas City’s average fare in 4Q2013. Spirit has some brand recognition in all of the markets it plans to introduce from Kansas City, reflected in its push into the US domestic market in recent years. It has established a crew base in Las Vegas and become the second largest carrier at DFW (albeit at just 4% of the seats on offer). Presumably it can have some point of sale strength in those markets; but more central for Spirit is offering a distinct lower cost alternative in Kansas City where for the moment it is limiting its direct exposure to Southwest Airlines. Spirit’s selection of Kansas City was likely less about Southwest’s dominance at the airport. Instead it was driven by the overall market dynamics – one largely national airline (Southwest) and network airlines that view Kansas City as a spoke to their hub markets. Those companies approach Kansas City’s revenue generation as a contribution on a total itinerary rather than just point-to-point service, which is Spirit’s operating profile. Spirit offers a much lower cost alternative than those airlines given that hybrid operators do not have a huge presence in Kansas City. Alaska Airlines offers flights to Seattle, but that is limited service, leaving an opening for Spirit to stimulate traffic without facing competition from a mid-market, hybrid type of airline. Without a threat from hybrid carriers, presumably Spirit’s new routes from Kansas City can spool up to maturity fairly quickly. In that respect, Kansas City offers a unique opportunity for Spirit. As it grows into new markets Spirit will find itself bumping into and competing with hybrid airlines more frequently. In recent years Spirit has not grown as aggressively from its largest base and headquarters in Fort Lauderdale while JetBlue has declared its intent to mine opportunities at the South Florida airport, and intends to grow to 100 daily departures by 2017. Spirit’s move into Kansas City should prove fruitful for the carrier as the market has the right mix of dynamics for service from an ultra low-cost carrier aiming to stimulate passengers priced out of the market. Spirit has always maintained that it co-exists with large network airlines in metropolitan markets since it targets lower-yielding, cost conscious travellers that have become increasingly unattractive to the three major US carriers American, Delta and United. It is not clear if the major airlines all hold a similar view. American has recently stated it keeps a close eye on Spirit’s movements. However, that is not a declaration that American has any intention of matching Spirit’s base fares, so Spirit for the moment is largely being left alone to carry out its strategy. The more pertinent question is what is Spirit’s next network move? With its hefty capacity growth in 2015, the airline needs to find more markets like Kansas City that fit its stimulation profile. Spirit is confident there are ample growth opportunities in the Americas for its ultra low-cost service, and with large scale consolidation in the mature US market essentially complete, there could be increasing space for bottom feeders looking to capture passengers squeezed out of the air travel market. And a reformulated Frontier is meanwhile watching all of these moves with great interest.